This omelette at International House of Pancakes is a delicious blend of ham, cheese, onions and hashbrowns topped with sour cream. Read on to learn how to make this restaurant copycat recipe at home in your own kitchen. 3 Tbsp cooked shredded hash brown potatoes. Add salt to eggs and beat. Stir in diced ham and onion. Cook for 5-7 minutes until the omelette in almost firm. Sprinkle on shredded cheddar cheese and cooked hash brown potatoes. 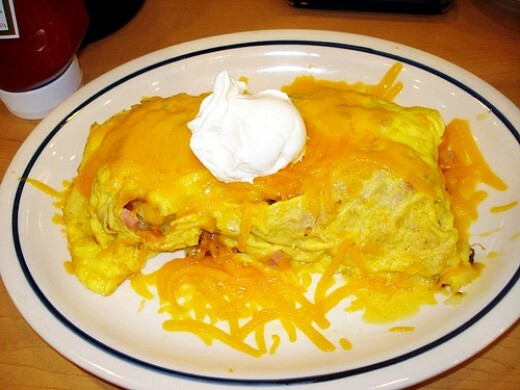 Fold the omelette in half. Top with more cheese and a dollup of sour cream.